I almost feel like I should apologize in advance for how detailed this tutorial is going to be, because I've never posted one with so many steps before! I'm not sorry though, because this is probably my favorite retro tutorial of them all, and I'm so excited that I finally get to present it to you! There are a lot of different things I could have called this, because its the perfect style for a any retro/vintage party or Mad Men premier, or with Halloween coming up soon its certainly the the key element for that Marilyn Monroe or Elisabeth Taylor costume! My hair does touch my rump but its pretty thin so don't go thinking that if its shorter that you'll have a harder time, because obviously its a faux bob tutorial, and if you already have short hair, then you're that much closer to achieving it! Step #1: Start by separating your smooth brushed hair in half by drawing a line from ear to ear, and tying the back half up for later. choose a dramatic side part from the front section and tuck back the smaller side for later as well. Begin your pin curling by rolling the curls as flat as possible, and Away from your part. You're going to curl in 1 inch sections, going in little rows. Each 1" square (approximately) section you're going to wrap around your clipless curling iron (or around both the clip and the barrel of a regular curling iron) and hold for a few seconds before sliding your iron out leaving the rolled curl in your hands, and you're going to pinch the curl together and secure to your scalp with a single or double pronged clip, or with a bobby pin. and move on to the next! Step #2: Once you've finished the front of your head with the curls pointing down either side start curling the back section by dividing it in half horizontally, then creating your pin curls from the top to the bottom, and pointing downwards. Once your whole head is covered in the pin curls, wait about 20 minutes more for the curls to cool and set completely before letting down the bottom level of curls. Step #3: Grouping them into sections of 3-4 curls, take your comb and combine them all together by combing from the roots to the ends a couple of times (pulling the hair taught), then slowly letting the curl settle back up into place (if you have shorter hair this is where you really have the advantage over ladies like me!). To begin shortening your locks, roll the bottom a bit to get rid of the ends and gather the whole curl in your palm, tuck it close to your head and pin in place at the height of your choosing. Step #4: once you have a whole level complete, spray well with some good hairspray, and move onto the next level of curls! Make sure you're combing the curls from the underside to pull the hair away from your face. When you get the the section of curls at your crown, tease a bit at the roots before combing out that section. 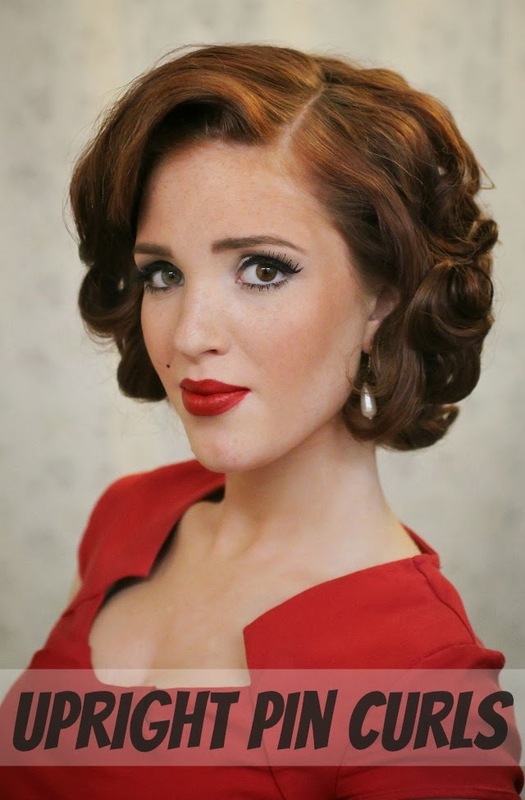 Step #5: To finish off the whole look, pull the front corner curl (from the smaller side) taught and tuck it by your ear. Tease the last three top curls at the base and then comb them out together. To complete the bangs comb the very front straight up, pinch the crease, and then comb back down and curve the hair under itself. Pin well, spray, and you're all done! After all that and I still wish that I could be more thorough in the instructions, so for sure ask if you have any questions! Remember that layers are only helpful for this style though not necessary, and I have side-swept bangs, so don't let that stop you either! Remember though that pin curls are pretty ambitious and a little more time consuming than most styles, so its not for the faint hearted:) but definitely for those mad men parties! Just don't start them on a day when you're short on time. In the end its really about having fun and just playing with your hair till its laying how you like it! OMG! This is such a gorgeous look! I absolutely love this! Thanks for sharing and have a great weekend! This is fantastic! Thanks for the tutorial. I'm definitely going to give it a try! You're a beautiful woman with an extraordinary talent. You look wonderful, like out of a movie of the thirties. Thanks for sharing your skills with us all. Sorry for my English is not very good. This is awesome--I would never guess that you don't naturally have a bob hairstyle. I agree! Other than the volume (and from looking at your other styles and the early pictures) I would think your hair is maybe shoulder length at most. :) Wow! This is absolutely gorgeous! 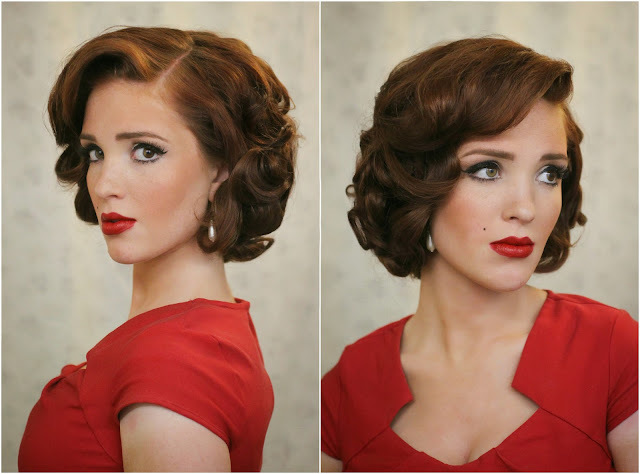 I love vintage hair styles and this is just amazing! this looks amazing , your one talented lady indeed! Great tutorial! I think detailed is a good thing. Sometimes it feels like (and I'm not talking about your tutorials, which are great) there are steps missing and then I don't know what to do. I love this so much! I had to cut my hair recently and while I'm trying to grow it out, I've been so frustrated with how little I can style it. This is something I can actually try. Thanks! I really want to try this, but I'm not sure how well it'd work :L Looks amazing on you though! You do such a wonderful job with these tutorials! I don't typically leave comments on the blogs I frequent, but I just wanted to let you know that these are just great, and this is always my "go to" site for new styles. Thanks so much for writing! I love this hairstyle! It reminds me of Peggy Carter in Captain America. saludos desde españa, te deseo lo mejor! tienes un blog increíble! I owe you a HUGE thank you!! I followed your incredible tutorial step by step and was able to turn my waist-length hair into the most perfect Betty Draper bob. My Halloween costume would not have been possible without you! I love your blog! There is such a variety!